The color of your urine may be a clear indication of your health condition. Urine characteristics like the color, density, and smell of urine can reveal much about the state of our health. We will present some of the things you can tell from the hue of your liquid excreta. 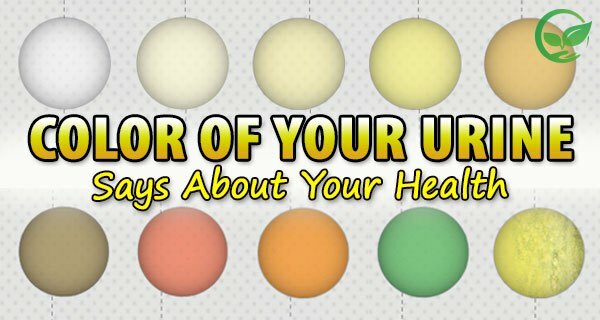 Urine may have very different colors. Range of color may be from deep amber or honey color to light straw with many golden variations. 1 – No Color (transparent)This is sign that your body has large amounts of water. You are drinking too much water, you must cut on drinking water. 2 – Pale Straw ColorThis is normal color of the urine. You are healthy and well hydrated. Keep up this balance. 3 – Transparent YellowThis condition is perfect. Your health balance is perfect, keep it that way! 4 – Dark YellowNormal condition except your body is need hydration. It is good to drink some fluids or water. 5 – Amber Or HoneyThis color of urine is sign that your body is exhausted and has urgent need of water or some liquids. You must drink water immediately because your body will dehydrate and you don’t want that. 6 – Syrup Or Brown AleAccording to numerous studies, this color shows that you have problem with liver. It may be liver disease or your body is dehydrated. 7 – Pink To ReddishHave you eaten beets, blueberries or rhubarb recently? If not, you may have blood in your urine. It could be nothing. Or it could be a sign of kidney disease, tumors, urinary tract infections, prostate problems or something else. Maybe even lead or mercury poisoning. 8 – OrangeYou may not be drinking enough water. Or you could have a liver or bile duct condition. Or it could be food dye. 9 – Blue Or GreenOkay, this is different. There is a rare genetic disease that can turn your urine blue or green. Also, certain bacteria can infect the urinary tract. But it’s probably a food dye in something you ate or due to medication. You won’t die from it, but see your doctor if it persists. 10 – Foaming Or FizzingIf this occurs from time to time, it is a harmless hydraulic effect. But, it can also be a sign of excess protein in your diet or a kidney problem. See a doctor if foaming happens all the time.